The new Yaris will be available in mid-May and Toyota will be making most of the parts here in India. The Toyota Yaris is finally coming to India. While in western countries, the car is sold as a hatchback, India will be getting the sedan variant. The new car will be made in India and will start selling by mid-May. 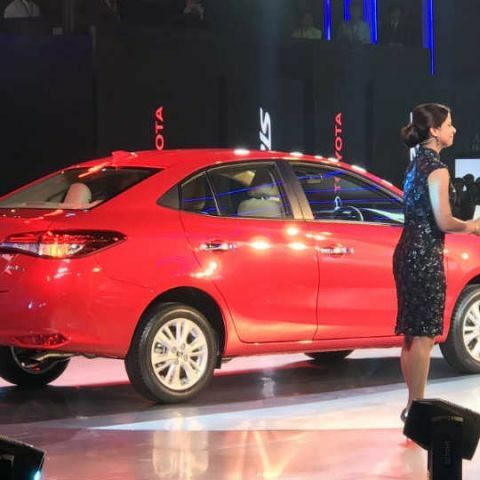 One can see the resemblance in design between the new Yaris and the Toyota Corolla. The car has good looks, thanks to large wrap-around headlights, the large air dam at the front and an equally well proportioned back. The design of the roof also complements the sporty look of the car. Toyota will be making most of the parts here in India including the engine. The Yaris will be available with just a single engine option in India, the 1.5L petrol. This is an all-new VVTi engine from the company which will generate about 108hp with either a six-speed manual or a seven-speed CVT-gearbox. That’s not all, the car will come with class-leading seven airbags, which also includes a knee bag. Toyota is also taking braking in the car quite seriously and this will be the second car in its class to get disc-brakes on all wheels. The vehicle comes with traction control, ESP, ABS with EBD, tyre pressure monitoring system and more. Other features in the car include Toyota has also taken care of some other creature comforts such as a steering mounted controls, rear power outlets, and the start-stop button. The CVT variant will also get paddle shifter for the ease of use.